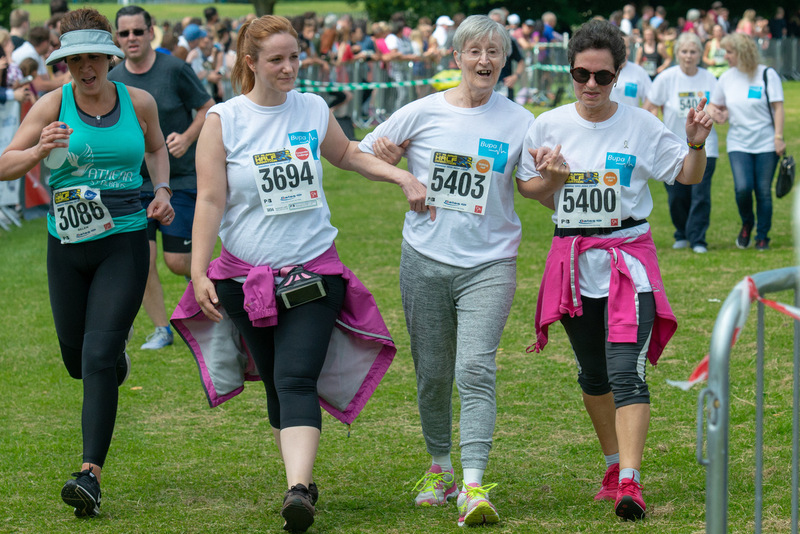 Kind-hearted care home staff helped Elizabeth Barber cross the finishing line of a half marathon – two years after the keen runner was told she would never walk again. Sporty Elizabeth, 72, suffered a life-changing stroke at her home in August 2016 and was found slumped at the bottom of her stairs by a friend hours later. Left paralysed and unable to speak, medics feared she would not recover. But after extensive treatment at a Bupa care home in St Albans, Elizabeth began to slowly regain her strength, co-ordination and mental aptitude. Super-fit before the stroke, Elizabeth had completed four marathons – taking part in her first aged 58. But it was only while helping Elizabeth through her recovery that the nurses realised her love of running. 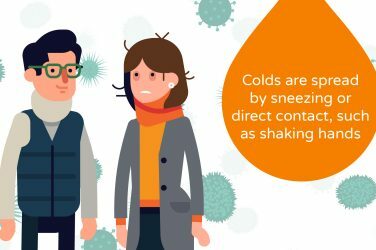 On learning this, the team of nurses from Bupa Tenterden House agreed to walk the St. Albans Half Marathon on Elizabeth’s behalf – and plucked her from the crowd to cross the finish line with them. Delia Abaza, Deputy Manager for Bupa Tenterden House, arranged the tribute and was among those taking part in the race. She said: “We’ve known Elizabeth for a long time, as she used to come and visit a friend in the home. ‘’After her stroke, she was in a very bad way and the doctors had said she might not be able to walk or talk again, but we knew Elizabeth was a fighter. “She’s come such a long way in the last couple of years, and – while the route is a challenge for us – we’re all so happy to be taking part and help Elizabeth cross that line. Mum-of-one Delia, 50, added: ‘’Knowing we’re doing it for Elizabeth has given us the motivation to complete it. ”To see her face at the end as she crossed the line made the hard work worthwhile. ‘’She is a very special lady, she is incredibly wise and an inspiration to us all. After collecting her medal, Elizabeth, who used to run a music shop in St Albans, said: ‘’It was an incredible feeling. ”I honestly could not imagine crossing a finish line again, and it is only thanks to Delia and the girls that I did it. ‘’After my stroke I was just lucky to be alive. 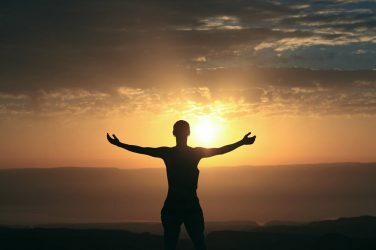 When it began to dawn on me I wouldn’t complete another race, I was devastated. “The support of the nurses here has always been fantastic, but now they are quite literally going the extra mile. 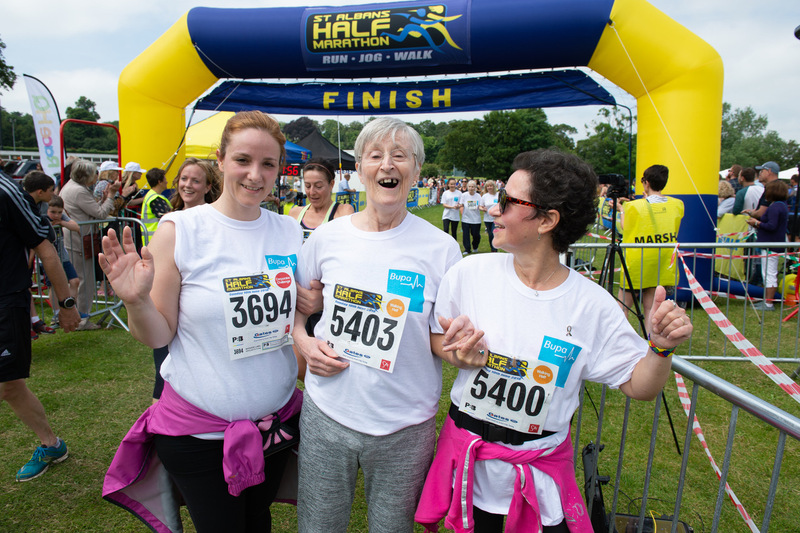 Inspired by Elizabeth, fellow care home resident Josephine Arnott, 76, also joined the nurses in walking the race. Timea Fordos, 33, also works at the care home and undertook the race, where residents and families attended to show their support. 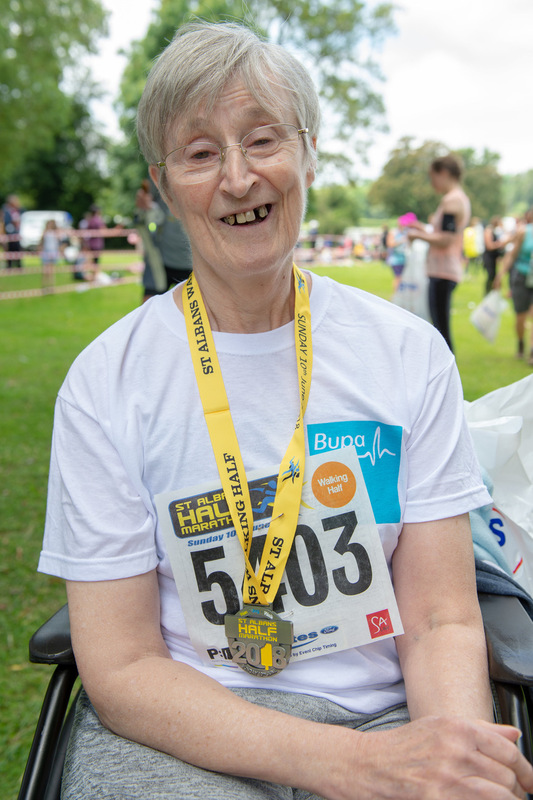 Elizabeth’s stroke occurred in August 2016 just a few months after she completed the Wokingham Half Marathon at the age of 70. She considered herself ‘fit as a fiddle’ having also run the London Marathon twice in 2006 and 2007 as well the Loch Ness Marathon in 2004 and the Lake Windermere version in 2012. After being discovered by a friend who dialled 999, she was rushed to hospital where she spent two weeks being assessed. Eventually Elizabeth was referred to rehab, but she still showed little signs of recovery. She was moved to the Bupa home after hospital teams concluded there was nothing they could do for her. With the support of staff at Tenterden House she slowly began to improve, and now almost two years after she nearly died, she is able to walk and talk, and has regained her love for life. * Earlier this year, Bupa Tenterden House was rated as ‘Outstanding’ by the regulators, putting it within the top 2% of care homes in England. In particular the report praised colleagues for making sure residents were ‘central to everything that happened’, encouraging them to pursue their personal hobbies and interests.